Some versions of the Mahabharata depict an incident where Draupadi gets to know that Karna is Kunti-putra and she regrets not allowing Karna to participate in her svayaṁvara. Is this event mentioned in any scripture? In Vyasa Mahabharata, there is nothing related to it. But in one folk tale story is there. This tale is known as Stains of Jambul, in which Draupadi confesses love for Karna. Draupadi did not tell regret words to Karna, but she confessed during the exile in 13 year near some lake. She also asked Krishna why Krishna did not tell her as he knew everything, Krishna told her as it was destined for her. If she would not insult Karna, Karna would never insult her. Krishna also tells her that Karna's destiny was also decided based on his past life deeds so he become Sut Putra instead of Surya Putra. Draupadi actually rejected Karna based on Krishna's gesture only. So she did not have any hate feelings for Karna. So she was not illegible to be blemished. So she said nothing to anybody. Yes she regretted in front of Pandavas as per tale(Not Mahabharata). "If I had married him, I would not have been gambled away, publicly humiliated and called a whore. For he has all the qualities possessed by my 5 husbands." Note: This story is not in Mahabharata written by Vyasa. But just a folk tale. The story of the Jambu fruit comes from a folk play from Maharashtra called Jambul-akhyan. It is said that the Jambu fruit stains the tongue purple to remind us of all the secrets that we keep from the world. The story you mentioned has no basis in scripture, at least not in Vyāsa Mahābhārata. Moreover, according to Vyāsa Mahābhārata, the svayaṁvara was rigged. 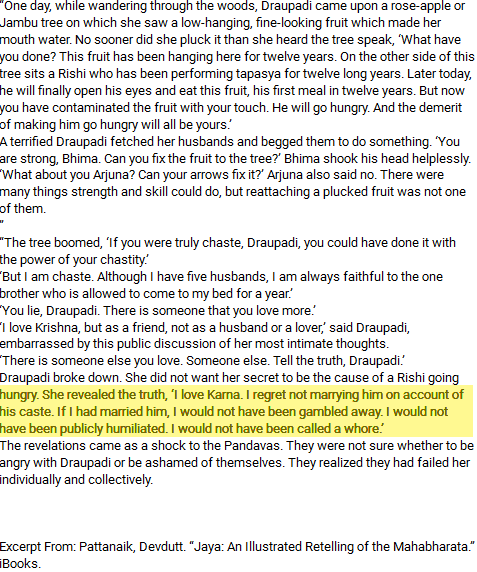 King Drupada was very keen on giving Draupadi away to only Arjuna and nobody else, even before the svayaṁvara began. Yajnasena [Drupada] always cherished the desire of bestowing his daughter on Kiriti (Arjuna), the son of Pandu. But he never spoke of it to anybody. And, O Janamejaya, the king of Panchala thinking of Arjuna caused a very stiff bow to be made that was incapable of being bent by any except Arjuna. Causing some machinery to be erected in the sky, the king set up a mark attached to that machinery. As far as Karṇa's participation in the svayaṁvara goes, there are two different official stories. Draupadi announces that she cannot marry a sūta (charioteer) so Karṇa drops his bow and withdraws from the contest. Then Karna, laughing in vexation and casting glance at the Sun, threw aside the bow already drawn to a circle. The later verses however indicate that Karṇa attempted to string the bow but failed. And that bow which Rukma, Sunitha, Vakra, Radha's son, Duryodhana, Salya, and many other kings accomplished in the science and practice of arms, could not even with great exertion, string, Arjuna, the son of Indra, that foremost of all persons endued with energy and like unto the younger brother of Indra (Vishnu) in might, strung in the twinkling of an eye. Yudhiṣṭhira later says caste was no bar for participating in the svayaṁvara so neither Drupada nor Draupadi had any right to reject anyone merely on the basis of their caste or profession. Then Yudhishthira addressed him and said, 'The king of the Panchalas hath, by fixing a special kind of dower, given away his daughter according to the practice of his order and not freely. This hero hath, by satisfying that demand, won the princess. King Drupada, therefore, hath nothing now to say in regard to the race, tribe, family and disposition of him who hath performed that feat. Indeed, all his queries have been answered by the stringing of the bow and the shooting down of the mark. It is by doing what he had directed that this illustrious hero hath brought away Krishna from among the assembled monarchs. Given two different accounts of the same story, one of them has to be an interpolation. This stanza [drstvā tam draupadi vākyam uccair jagāda nāham varayāmi sūtam] does not occur at all in the entire Southern recension, and among the versions of the Northern recension, it does not occur in the Kashmiri, Maithili and Bengali versions. It is found only in four Devanagari mss. (out of a total fourteen used for the critical edition), and one (out of three) Nepali ms. It is therefore clearly a very late addition to the text. If Official Story 1 did not take place in reality, the question of Draupadi regretting for not allowing Karṇa to participate in her svayaṁvara does not arise because Karṇa simply failed at the archery test. Not the answer you're looking for? Browse other questions tagged mythology mahabharata karna draupadi swayamvar . What are the valid and foolproof methods of determining whether a certain scripture is interpolated or not?